KUCHING: Christian mission schools are found throughout the state but not many are as iconic as the city’s very own Sunny Hill School. Ex-president of Sunny Hill School Students’ Association Roland Teo gives out a donation to a student during the fund-raising dinner. Public Health Assistant Minister Datuk Dr Jerip Susil praised Sunny Hill School for withstanding the test of time despite not receiving much funding from the government. “Ever since I was young, I have heard many beautiful things about Sunny Hill School – one of the Christian schools in Sarawak dedicated to producing the finest students in Sarawak. When I was a teenager, I was excited for the privilege to visit the school for a seminar in 1974,” he recalled at the school’s fund-raising dinner last Sunday. The Bengoh assemblyman understood the stress of running a private school and he pledged a sum of RM30,000 to the school at the dinner. 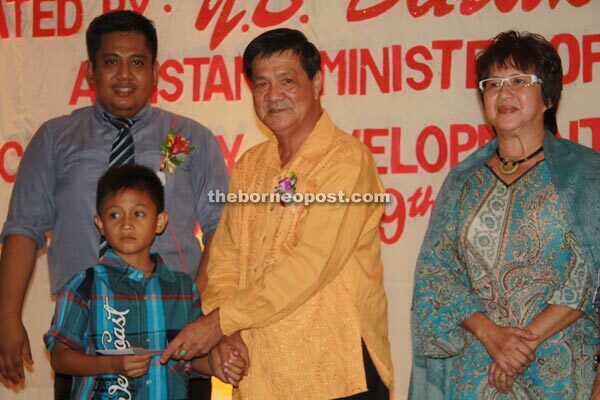 He said Christian mission schools are commonly found throughout Sarawak but not many are run independently like Sunny Hill made possible by the school’s dedicated board of members, staff and teachers sincere in educating students in Christian values. “Moral values should never be left out of our lives. Sunny Hill is one school that believes in teaching and educating society in such values albeit from a Christian point of view,” he said. Dr Jerip said schools such as Sunny Hill or any other privately-run schools in Sarawak have no difficulty accepting students regardless of race or religion due to the religious tolerance in the state and as youngsters are taught to respect each other. Naris Munan, one of the school’s senior teachers interviewed by The Borneo Post yesterday, commented she was grateful the school continued to get recognition for its hard work in education. “I am grateful not only for the sum pledged but for the recognition of the school from such a prominent member of society. We will never stop giving the best to those enrolled with this school,” she assured. She said the money will be used to renovate and upgrade the school as most of its facilities are in a state of deterioration. Sunny Hill School operated by the Sarawak Seventh-Day Adventist Mission was founded in 1900. The present school building located at Third Mile area was built in the 1950s. Padawan Municipal Council (MPP) chairman Lo Khere Chiang also attended the dinner.